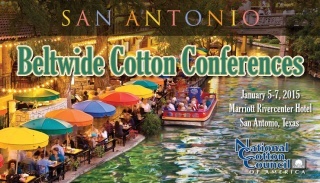 Staff members from The Cotton Board, as well as staff from Cotton Incorporated’s Agricultural & Environmental Research Division will be traveling to San Antonio, Texas on January 5th through 7th to attend the 2015 Beltwide Cotton Conferences. Coordinated by the National Cotton Council and its cooperating partners, this annual forum is recognized as the global champion for cotton technology transfer. Cotton Incorporated’s dedicated staff and research cooperators will be on hand at the 2015 Beltwide Cotton Conferences presenting noteworthy research results that address many ever-present issues in cotton. Information to be presented includes 2014 research findings on the control of Texas Root Rot, an old foe that has generated new attention recently. There will also be information on target spot, a newer disease to cotton. Target spot is the principal disease of rubber trees in the tropics that has recently moved into subtropical regions. It has been troubling cotton growers in Georgia and Alabama since 2011 and showed up this year in Tennessee and Louisiana. Beltwide’s technical conferences have been our industry’s flagship opportunity for scientists to share their latest discoveries from the previous year’s research and coordinate new research projects for the year ahead. Funding from Cotton Incorporated annually supports over 400 research projects designed to address critical needs of U.S. cotton growers, and over half of the presentations at this year’s Beltwide will again reflect support from Cotton Incorporated. For more information on the 2015 Beltwide Cotton Conferences and to register please visit: www.cotton.org. A significant accomplishment has been made in the sequencing of the cotton genome which will fuel multi-disciplinary, basic and applied research to help increase cotton productivity. "This information will significantly advance cotton research worldwide," said Dr. Mike Galyean, Dean of Texas Tech’s College of Agricultural Sciences and Natural Resources. "The genome sequence will eventually lead to improved cotton varieties containing environmentally friendly traits, which are preferred by producers, processors, manufacturers, and consumers." This research was completed under a public-private partnership between the State of Texas, Texas Tech University, and Bayer CropScience and was funded in part by Cotton Incorporated. Dr. Don Jones, Director of Agricultural Research at Cotton Incorporated, said this sequence knowledge is another tool for improving commercial cotton. 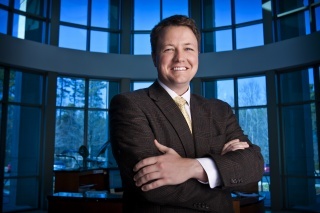 "This accomplishment is another cornerstone in understanding the biology that leads to higher yield, improved fiber quality, and better stress tolerance while reducing inputs used in producing the crop," said Jones. Dr. Mike Gilbert, Vice President of Global Breeding and Trait Development at Bayer CropScience, stated that this accomplishment is another great example of the synergy that can be created to deliver innovation in cotton that will improve the sustainability and economic value from the farm to the consumer: "Through our collaborative cotton research program, Bayer CropScience and Texas Tech University under the umbrella of the Texas Research Incentive Program have partnered to create cutting-edge programs in fiber science and genomics to advance cotton knowledge and products. Together we are committed to providing long-lasting solutions for growers and the global cotton community," he said. 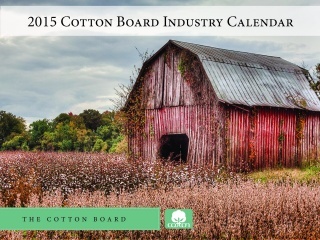 Production of the 2015 Cotton Board’s Industry calendar is now complete and the calendars have been mailed to every cotton grower who produced at least 50 bales of cotton in 2013. If you did not receive a calendar and would like to, please call The Cotton Board at 901-683-2500. 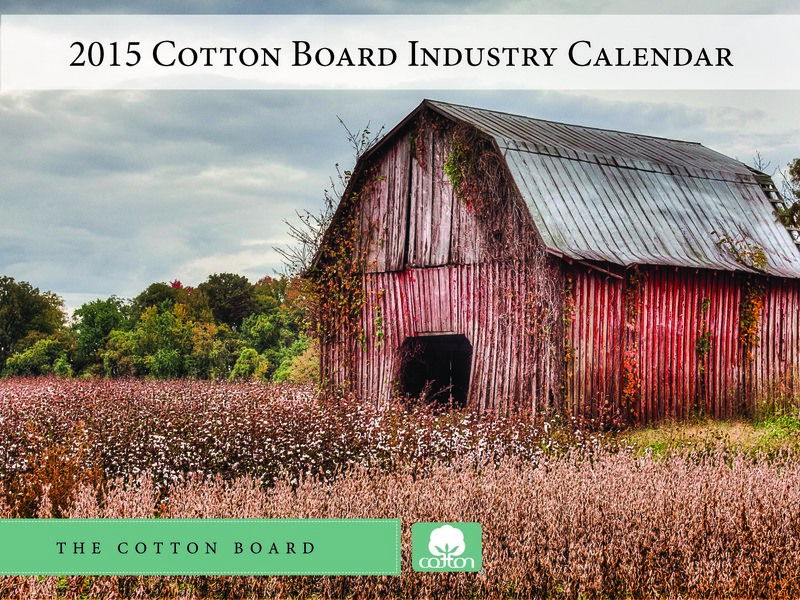 Cotton Incorporated is dedicated to helping producers improve their bottom line. From webinars, farming decision aids and crop insurance advice, to risk management and pricing strategies, Cotton Incorporated is committed to arming producers with the tools they need to increase their profitability of producing cotton. The decision aid section of http://www.cottoninc.com/fiber/AgriculturalDisciplines/AgriculturalEconomics/ is great for grower level information. Depending on the decision aid utilized, information is entered about the specific farming operation and then the user is provided a bottom line answer that allows them to play "what if" with scenarios ranging from the value of cotton in the CCC loan and irrigation, to yield monitors, harvesters and government payments. The more specific the information entered, the better the decision aid will assist in decisions affecting profitability. Chinese and Pakistani prices declined rather sharply last month, while other international benchmarks held steady. Prices for the March New York futures contract were largely unchanged and have remained within the same range, between 58 and 61 cents/lb, that they were in last month. The A Index has also been relatively stable, holding to levels between 65 and 69 cents/lb. Chinese prices, as described by the CC Index, began another round of decreases in late November. Over the past month, the CC Index lost a further 7%, falling from 110 cents/lb to 102 cents/lb. Even with the recent declines in cash prices described by the CC Index, the Chinese ZCE futures market continues to predict further losses. Values for the most-actively traded May ZCE contract have dropped to levels near 95 cents/lb. In the latest USDA report, forecasts for both world production and consumption decreased. The global production figure declined 630,000 bales, from 119.6 million to 119.0 million, with the U.S. harvest estimated to decrease by 474,000 bales. The global consumption figure was also decreased by 1.3 million bales. Price movement for the past several years can be explained through dynamics in exportable supply and import demand. When the Chinese government was making large purchases through its reserve system, global import demand shifted higher as China allowed mills to fill orders with a higher proportion of imports relative to domestically produced cotton. Strong Chinese import demand, along with the persistent drought in West Texas that inhibited stocks from accumulating in the U.S. and effectively held world exportable stocks at lower levels, supported higher prices for the past three crop years. In 2014/15, the situation is reversing itself. Easing drought conditions in West Texas have enabled a U.S. crop forecast to be 25% larger than last year. At the same time, China is pulling back on imports. This crop year, China is forecast to import less than half of the total in 2013/14 and less than a third of the cotton imported in 2011/12 and 2012/13. The steep reduction in Chinese import expectations is based on the announcement from the Chinese government that no quota will be issued beyond the WTO-related minimum of 4.1 million bales for the 2015 calendar year. Decent harvests in both the U.S. and India are occurring at the same time, and the corresponding buildup of exportable supply simultaneous to the pullback from China can be expected to keep downward pressure on prices.